Tulsa shootings: Jacob England, Alvin Watts, and George Zimmerman—examining the roots of vigilantism. Parsing the uncomfortable connections between last week’s Oklahoma killings and the death of Trayvon Martin. After weeks of despairing over the decisions made by the Sanford, Fla., police who have failed to arrest George Zimmerman for the killing of Trayvon Martin, it’s a relief to hear that the police in Tulsa, Okla., seem to be handling last week’s frightening shootings there with careful professionalism. On Friday morning, two men in a white pickup truck shot five people, perhaps chosen at random, in predominately black neighborhoods. Three were killed and two were injured. In the aftermath of this awful shooting spree, the Tulsa police formed a task force with more than two dozen local, state, and federal investigators. 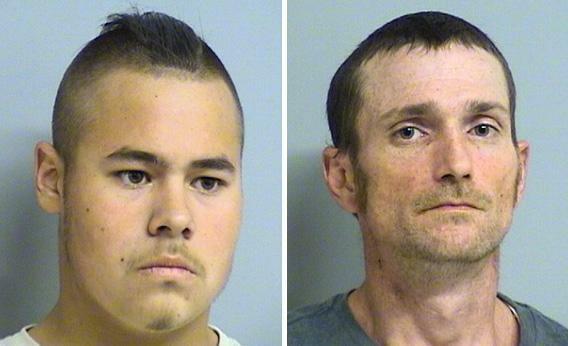 Their quick action netted a tip from Oklahoma’s Crime Stoppers program, and on Monday morning the police arrested 19-year-old Jacob England and his roommate, 32-year-old Alvin Watts, as suspects in the shootings. In the aftermath of the crime, it also emerged that England had posted a desperate and racist message on Facebook about the shooting death of his father (which he blamed on a black man) and the suicide of his fiancée. “Today is two years that my dad has been gone shot by a f—— n—– it’s hard not to go off between that and sheran [his fiancée] I’m gone in the head,” he wrote. England is a Native American who has called himself white and Watts is white, while all the victims were African-American. The police, though, have been wise to avoid calling the shootings hate crimes at this stage. It’s hard not to connect England’s racism to the acts of violence he allegedly committed, but it’s good policy for the police not to make pronouncements when facts are still being gathered. At the same time, in the wake of this shooting and Trayvon Martin’s, it’s impossible not to ask questions about the role of race in vigilantism. It’s hard to imagine Zimmerman jumping to the conclusions he did if Martin was an unarmed white teenager. It’s also hard to fathom that England would open fire on a group of randomly targeted white people if he thought his father was killed by a white man. The African-American man who was a “person of interest” in England’s father’s death, Pernell Jefferson, is in prison for pointing a weapon, but wasn’t charged with the killing. According to the news coverage at the time in the Tulsa World, England died in a fight with Jefferson, after Jefferson allegedly tried to break into England’s daughter’s apartment. Jefferson is still facing charges relating to the altercation, of attempted burglary and felony firearms possession. Oklahoma has a Stand Your Ground law as well, passed in 2006. Mediaite speculates that it’s because of that law that Pernell Jefferson wasn’t charged with shooting Carl England. I’m not sure that’s right, but it seems plausible—and it suggests that what we’re seeing in Tulsa is how Stand Your Ground laws not only get vigilantes off the hook but fuel the anger that drives them to begin with. One of the fears in the wake of Martin’s death has been that people in Sanford will take justice into their own hands to avenge the teenager’s killing. Now in Oklahoma, in the person of Jacob England, we could be seeing just such an avenger. It’s scary enough to know that there are vigilantes in our midst. It’s scarier still to think that our public policy encourages them.